He was already considered as a « natural born » American citizen via his pre-Constitution Maryland citizenship. Baltimore, MD – Lafayette St.
Baltimore, MD – Lafayette Ave.
Brandywine, MD – General Lafayette Blvd. Frederick, MD – Lafayette St.
Frederick, MD – Lafayette Rd. Havre de Grace, MD – Lafayette St.
Laurel, MD – Lafayette Ave.
Riverdale, MD – Lafayette Ave.
Woodlawn, MD – Lafayette Rd. This portrait of Lafayette by an unknown American Artist hangs in the Museum of the Historical Society of Maryland in Baltimore. This is the original Rigbie House, which still exists. This site is just across Spa Creek from historic downtown Annapolis. Maryland’s legislature honored Lafayette by making him and his male heirs « natural born Citizens » of the state, which made him a natural born citizen of the United States after the 1789 ratification of the new national Constitution. • December 17 – Lafayette arrives Annapolis/Maryland at 3:00 pm, is received in the Senate chamber and visits Fort Severn. He attends a ball that night. He is formally received at the Senate house on December 20. 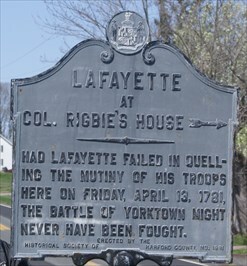 • December 24 – Lafayette arrives at the « Jug Bridge » crossing the Monocacy River on the National Pike east of Frederick MA. • January 1 – Attends a banquet hosted by Congress Washington/D.C. July 27 – Departs West Chester for Lancaster, Pennsylvania.